On one hand, I think the argument that a writer should have some say over where and when their writing is re-used once it is published makes sense. They wrote it. It’s their ideas. They took the time to craft it into something worth curating. They created something. 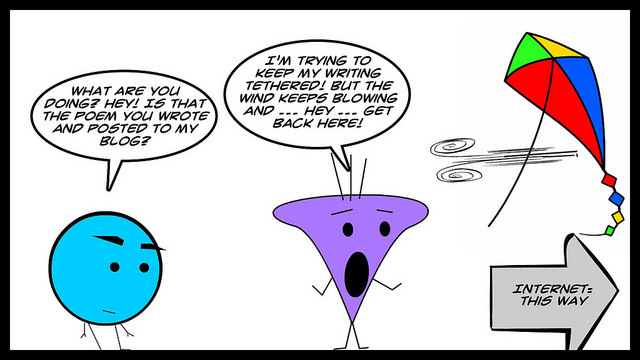 … digital writing is untethered writing. This ability to curate and be curated doesn’t mean that someone has permission to scrape your content off a website and put out there elsewhere as if it were their own. That’s theft. That’s not what I am talking about (although digital spaces does make that easier than ever to do). What I mean is that while we — the writer — might put some writing at a certain website, such as this blog or that digital space over there, someone else might come along and pull what we made into another project via RSS or hyperlink or some other format, and the writing moves onward. Or, as Cory Doctorow wrote in his book — Information Doesn’t Want to Be Free — thatI recently reviewed here in this space (maybe you curated it or bookmarked it? ), we can think of content that we create (writing, media, etc.) as a dandelion in its puffy seed phase, casting ideas to the wind with hope that something will catch root somewhere, in some time. If you write it, someone may read it. You just won’t necessarily know when and where your writing will find its reader. You need faith — faith that your writing can withstand the sharing world. Faith that your ideas can travel and still have impact. Faith that the digital world is not taking away from the writing experience, but adding to the potential: of audience, of medium, of impact. It’s complicated and frustrating and liberating, too — this idea of ownership with digital writing. Sites put up paywalls, I know. Others use technology that resist copying or sharing. I’m all for Creative Commons designations. None of this seems to really matter, though. The writing moves on at its own pace, in some form or another. Again, Doctorow’s “think like a dandelion” metaphor seems apt. I find myself coming more down on the side of “let the ideas go free as much as possible” than the side of “keep the writing tethered to the extent possible.” I know that makes a lot of writers uncomfortable. It may be that those writers will avoid the digital spaces, and hope that the dandelion seeds still take root somewhere. Me? I’m one of those fools who takes a deep breath and sends the seeds scattering.